A couple of months ago I was looking around at cake tins as I needed some to make Jack's birthday cake. I had in mind that I wanted to make a 2 tier cake, either round or square. I've got a load of cake tins, both round and square but they were either not deep enough, the wrong size or the sides sloped in. My Mum gave me a Lakeland catalogue when she came up to visit one weekend and when I was browsing through it I spotted exactly what I wanted - a Silverwood Multisize Pan. The problem was that it was £25.99 which to a cheap-skate like me seemed rather a lot for a cake pan. I thought about it for a while and then took the plunge and ordered it, along with a few other bits that I 'needed'. I decided to make an 8" cake for the bottom layer with a 6" cake for the top. 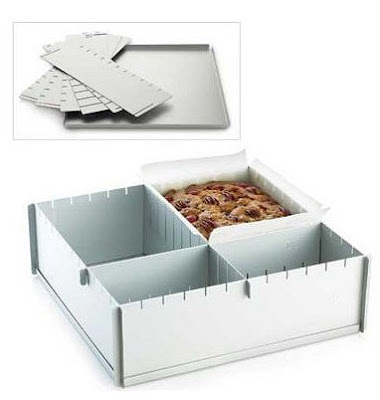 The pan comes with 2 panels that can be moved within the frame to make any square or oblong cake from 1" up to 12" (why anyone would want to make a 1" cake is beyond me). I then made two 6" cakes - AT THE SAME TIME...how good is that! So now this one pan has taken the place of an 8" pan and two 6" pans which makes me feel much better about spending £25.99 as I felt I then had 3 pans. But it didn't stop there..... the other day I had the urge to make a banana bread, or rather the banana's were resembling elongated pieces of coal & were destined for the bin if they didn't get used up. I'd printed out a recipe a few days earlier that I'd seen on Cooking, Cakes & Children and thought I'd give it a go. I've got a small loaf pan but once I'd mixed the batter up it no way looked like it was going to fit in there and Banana Loaf would not be banana loaf if it was in a round tin so I assembled my trusty Multisize pan and positioned the inserts to make a loaf tin. So now it has taken the place of FOUR cake tins. That has got to be well worth £25.99 (my husband will read this post so I'm hoping I've done my best to justify paying almost £26 on a cake pan now - plus a few other bits). So if you're looking for some cake pans I would really recommend you buy this, you won't regret it. And do you know what the best part about this tin is? It folds FLAT, yep no more cupboards so full of pans that every time you open the door they all slide onto the floor with such a crash that the baby wakes up. Ok so maybe that part isn't true, I still have my cupboard full of pans and I use and need each and every one of them (that is for the benefit of my husband again). The only downside that I have found is that some of the cake seeps out of the sides when baking but that may be down to my poor pan lining skills. If you want to buy this pan you can find it on the Lakeland website here, and for a limited time (until 2nd May) they are offering Free Delivery on orders over £20, and if you order over £59.99 they will send you a free Star Swirly Cupcake Stand (worth £10.99). You can also buy an extra pair of dividers for £8.49 to give you even more options - for example you can bake NINE 4" cakes at one time. Oh and did I mention that the box also includes a recipe for a fruit cake in sizes from 6" up to 12". This is NOT a sponsored post, I paid all twenty five pounds an ninety nine pence of my hard earned cash to have this pan in my possession. I've looked at that cake tin before and dismissed it for being too expensive, but after seeing your cake I might have to rethink. Hello it's me, I am also visiting this web site on a regular basis, this web page is actually fastidious and the visitors are in fact sharing good thoughts.